If you’re like most people, you want to make sure you and your loved ones pay the least amount of tax possible. Many use year-end gifts giving as a way to transfer wealth to younger generations and also reduce the overall potential estate tax that will be due upon their death. Below are some steps you can take to make gifts to your heirs without triggering any gift tax liability. Some of these techniques may also reduce your own income tax liability. A combination of estate and gift tax exemptions can be used to significantly reduce the overall tax liability of your estate. Upon your death, the federal estate tax may be owed. A portion of your estate is exempt from the tax. That exemption amount is set by Congress and can change from year to year. For deaths that occur in 2011, the exemption amount is $5 million and the value of an estate in excess of that amount is subject to estate tax. 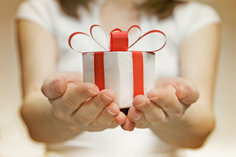 The annual gift tax exclusion allows each individual to make annual gifts of up to $13,000 to each recipient. There is no limit to the number of recipients who may each receive up to $13,000 totally tax-free. Married couples may gift up to $26,000 to each recipient without triggering any tax liability. This annual exclusion expires on December 31 of each year, and larger gifts may be made by splitting it up into two payments. By making a payment in December and one the following January, you can take advantage of the gift tax exclusion for both years. Keeping annual gifts below $13,000 per recipient ensures that no gift tax return must be filed and that there is no reduction in the estate tax exemption amount available upon your death. Payment of a beneficiary’s medical expenses is also excluded from the gift tax. There is no limit to a number of medical expense payments that may be excluded from tax. To qualify, the payment must be made directly to the health care provider and must be the type of expenses that would qualify for an income tax deduction.